Privately, the signs are clear: A company faces financial distress, anxious creditors demand payment, and executives weigh an array of options from restructuring to dissolution. Publicly, however, the company’s daily operations continue: Business deals are made, and investor funds continue to pour in – even though the company’s officers know that the business is failing. Small wonder, then, that “deepening insolvency may be the holy grail of damage liability for plaintiffs seeking to recover losses through litigation,” authors Kathy Bazoian Phelps and Prof. Jack F. Williams note. 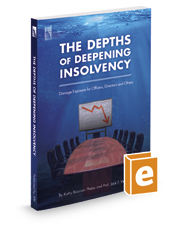 The Depths of Deepening Insolvency: Damage Exposure for Officers, Directors and Others is written from both the plaintiffs’ and defendants’ perspectives. It offers a historical analysis of the doctrine, its significance in calculating damages in a variety of liability scenarios, the interplay of the doctrine with fiduciary duties, and potential defenses that may be asserted to deepening insolvency allegations, as well as a state-by-state list of significant caselaw on this issue. The book will be an invaluable resource for any company executive juggling the competing demands of the troubled firm and its obligations to investors, as well as for litigators practicing on either side of the insolvency aisle.